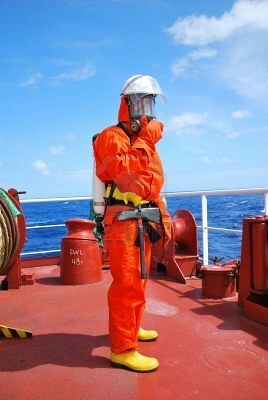 Fire prevention is one of the most essential safety measures on board a chemical tanker. Foam extinguishing is provided on many chemical tankers and on a majority of modern large crude oil carriers. Of all the extinguishing methods in the IMO Code foam is preferred, but the use of dry powder is generally accepted as an equivalent method. Water soluble chemicals, e g. acetone, alcohols, have a tendency to break down conventional foams and render them in effective. Chemical tankers should therefore be provided with alcohol- resistant foam ( "alcohol foam"). Heavy foam (water/air ratio abt 1:15) is in modern tankers distributed by means of several foam guns which can cover the entire deck area, by means of portable jets or by means of long portable pipes. The latter are intended to be used for the introduction of foam into a tank on fire without risk for the foam to dip underneath the liquid surface. Foam has a limited extinguishing effect on very gassing cargoes: the gases penetrate the foam and burn on top of it. Foam is a good method for fire prevention: a deck area or a free cargo liquid surface can be protectively foam covered if there is a danger of fire. If a liquid surface is to be foam covered: direct the foam onto a bulkhead or other vertical surface and let it spread from there and float out to cover the entire liquid surface. The foam operator may have to be shielded against heat radiation by means of a water spray. Medium density foam (water/air ratio abt 1:200) is used in enclosed spaces such as pump rooms. Medium density foam can be produced very simply in fixed distribution jets under deck, in e g a pump room, by using the ejector power of the water stream to draw air into the water foam mixture. Medium density foams are intended to cover the bottom part of a compartment. The installation is very simple and relies on starting the fire-pump only. Light foam (water/air ratio 1:200 - 1:1000) is only used in enclosed spaces such as engine and pump rooms. It is usually produced by means of a water driven fan which blows up the foam mixture. The foam is intended more or less to completely fill up the compartment in question. Light foam is sometimes used as a preventive blanketing medium when "hot work" (e g welding) has to be carried out in a cargo tank, which may not have been possible to clean perfectly. The whole tank bottom is then foam covered, leaving only the work location free. Of course the tank has to be guaranteed gas free before starting hot work. Similarly neighbouring tanks can be protected before welding is started on bulkheads.